Join us Sunday and bring along man’s best friend. Sturt Football Club is hosting Dog Day Afternoon 1pm – 4pm on the eastern side of Unley Oval, entry via Langham Terrace next to the Tennis Club. 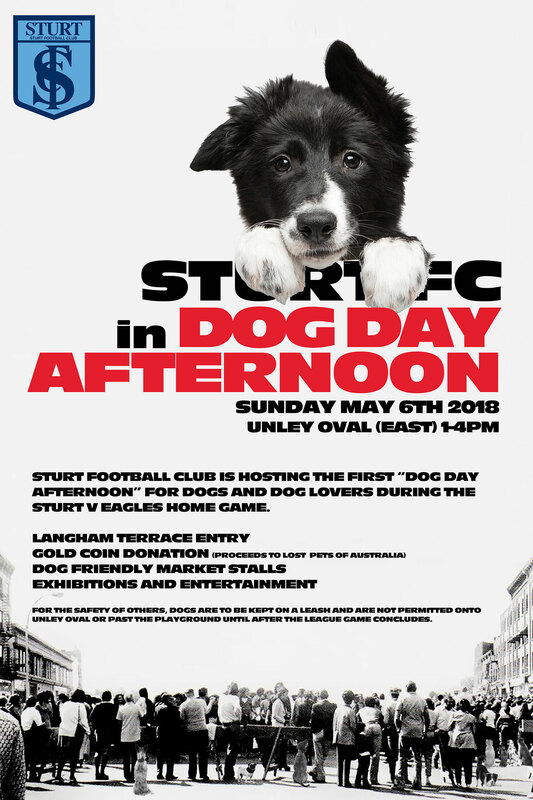 Gold coin donation on entry with all proceeds going to Lost Pets of South Australia. We have some amazing stalls lined up to treat your dog. For the safety of others, dogs are to be kept on a leash at all times and are not permitted onto Unley Oval or past the playground until after all games have concluded. This includes quarter and half time breaks. You are also reminded that you are responsible to clean up after your dog and that The City of Unley issue fines for non-compliance.